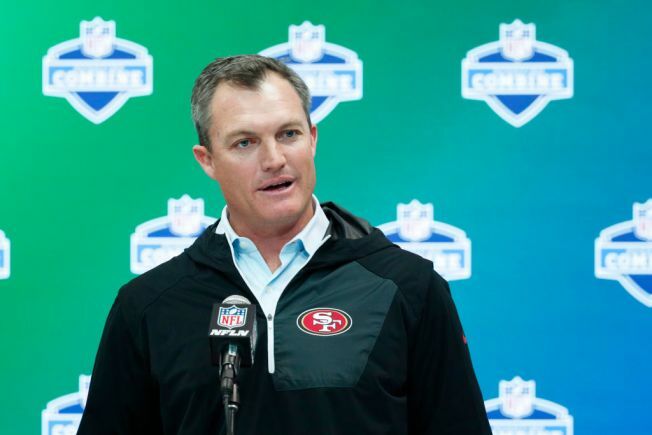 With the start of the NFL Draft less than a month away, 49ers fans can expect to read and hear about reports that San Francisco is listening to trade offers for its second overall pick. For now, it appears the Carolina Panthers have made the first move. Matt Barrows of the Sacramento Bee has reported the Panthers – who have the No. 8 selection in the first round – have opened talks with the 49ers about acquiring the 49ers’ top pick. And, by moving down just six spots, new 49ers general manager John Lynch could still get a prime prospect at No. 8 while also adding several picks to a thin roster. With the eighth pick from Carolina, the 49ers would still be in position to get an impact offensive or defensive player such as Clemson wideout Mike Williams, Tennessee defensive end Derek Barnett, LSU cornerback Tre’Davious White, Alabama linebacker Reuben Foster or one of the top quarterbacks available, Deshaun Watson of Clemson or Mitch Trubisky of North Carolina. Another scenario floated recently by Sports Illustrated’s Chris Burke, would involve the 49ers getting an additional pick late in the first round to take Notre Dame quarterback DeShone Kizer, whom Lynch praised at the NFL Combine in February. With plenty of time left until the first-round selections are made on April 27, the 49ers aren’t likely to make a deal now. They’ll wait as long as possible and see if better offers surface.